Ludovico Marchetti was born in Rome on May 10, 1853. He received his early artistic training in the atelier of the Spanish painter Mariano Fortuny y Marsal who had a studio in Rome during the early 1870’s. By 1878, at the age of 25, Marchetti left for France. Here he continued his studies and began exhibiting at the Paris Salon, as well as exhibition halls in Berlin and Munich. 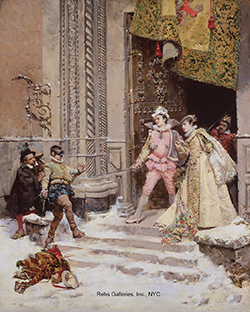 Like many of his contemporaries, Marchetti specialized in history paintings – scenes from the bygone era. 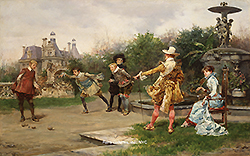 Among his favorite subjects were the cavaliers and troubadours of the 18th century – dressed in there richly colored clothes. Marchetti remained in Paris until his death on June 20, 1909.